DUBLIN (CNS) — An Irish priest based in Sydney said he was struck by how people turned to prayer when a gunman took hostages at a cafe. Father Brendan Purcell is based at St. Mary’s Cathedral, just a five-minute walk from the nearby Lindt Cafe, where Iranian-born Islamic cleric Man Haron Monis took dozens of hostages on morning of Dec. 15. Father Purcell said there was a lot of fear as the local area, including the cathedral complex, was put on lockdown by authorities. “No one knew what was going on, and there were threats of bombs around the central business district. The cathedral and the cathedral school were put in lockdown,” he said. “Even though a kind of flat secularism is as strong here as anywhere, you could wonder if it’s skin deep, in that whenever there’s a huge crisis like this, almost everyone is calling for prayers,” said Father Brendan Purcell. The siege ended some 16 hours later when commandos stormed the cafe. Two hostages and Monis were killed, and several people were injured. 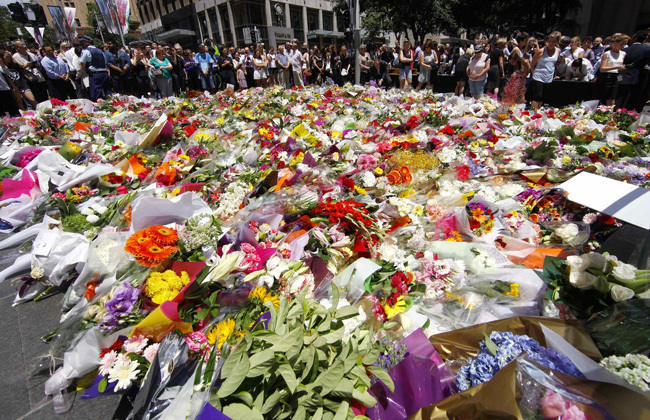 “There’s a huge pile of flowers being left in a massive shrine just outside where it all happened, and the whole event has brought Australians together as a tragedy they feel shared by everyone,” Father Purcell said. “One of the positives from the event has been its unambiguous condemnation by all the main Muslim leaders here,” he said. During the siege, Father Purcell said, it was “very noticeable” on social media that Australians at home and abroad were calling for prayers. “Even though a kind of flat secularism is as strong here as anywhere, you could wonder if it’s skin deep, in that whenever there’s a huge crisis like this, almost everyone is calling for prayers,” he said. “This incident has touched thousands of lives. People do turn to God when they need support. Catholics only make up about 25 percent of the population, and they might not even be regular Massgoers, but still people turn to prayer,” the priest said. Father Purcell told of how he felt helpless during the siege, so he, too, turned to prayer. “Personally, I didn’t know what to do during the siege, especially as we were so near to it, so I spent nearly an hour doing the Stations of the Cross in the little chapel here and found it amazing how each station was a meaningful window into what the hostages were going through — like the first station: being wrongfully ‘arrested’; the three falls for the various agonizing mood swings and fears I guess many were going through; the comforting of Mary, Simon of Cyrene and Veronica for all those outside trying to stay in contact via mobiles with those inside, as well as whatever support they were able to give to each other. “At the time no one had died, but of course the death of the innocent Jesus would stand for the two who were, in fact, killed,” he said. “If I were to say the stations again today, I’d be thinking especially of those two for the taking down from the cross and the burial of Jesus in the presence of his mother and St. John,” he said. Hours after the siege ended, Father Purcell joined Sydney Archbishop Anthony Fisher at the cathedral for a Mass for the victims and others caught up in the terror.